Click here to see all of the previous Polish Project posts. Thoughts: Stupid f–king Kardashian glitter polishes. Kendall on the Katwalk chipped off in a massive chunk like 15 hours after application. 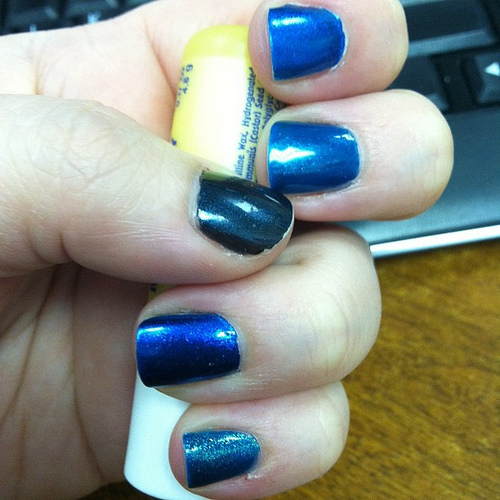 I didn’t feel like re-doing it, so I just painted my index finger with Swimsuit…Nailed It. Too Rich For You is a weird polish that looks black in the bottle with some blue shimmer in there, then you apply it and it looks like black with something else. Swimsuit…Nailed It is AMAZING. It’s a gorgeous color and the application is fantastic. It was really the same for Yodel Me On My Cell and Catch Me In Your Net. CMIYN was one of the first polishes I bought myself after I stopped nailbiting, and it is spectacular. It’s the polish I’ve used the most times, and I’m going to be devastated when it runs out. It’s obviously a favorite because it’s being sold online for way over the original price. Verdict: The two NOPIs are going away, into the share pile. The rest are totally staying. 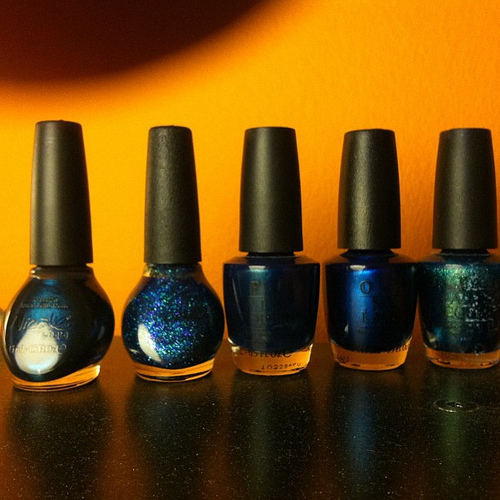 Side note – I am screwed because I have a lot of glitter polishes waiting for testing, and I am just not interested in it. Someone needs to tell me what is the best way to apply glitters so that they last! I have so many glitters to try for the project, so I have to have a better experience. Any links or advice are really appreciated. Thanks for coming by to visit JamieSanford.com. If you enjoyed reading this post, please follow @JamieSanford on Twitter, subscribe to the RSS Feed or subscribe via email so you'll always be updated of my latest posts! Just enter your email address below and click the Subscribe button. Links to items on JamieSanford.com may be affiliate links. Therefore, purchases made through those links may earn me a commission.